Most of the face-to-face encounters you’ll find on this site involve getting a group of people into a room for a length of time, supported by training or facilitation; below is an alternative. 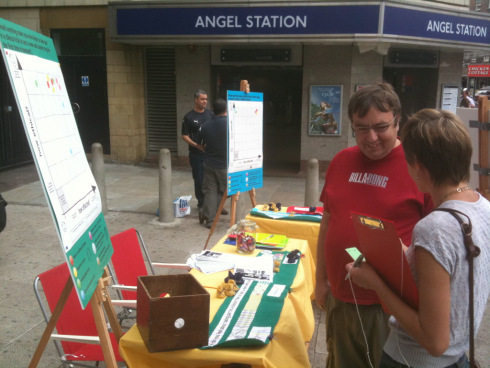 Do please share your experiences of running discussion groups and stalls on the street. What worked, or didn’t? Do you think you could use or adapt the methods here? Street Talk – which I am shocked to see is now seven years old – aimed to engage people as they went about their everyday lives. It did so by developing a version of a street stall that would help people think about, and give their view upon, the ways in which individuals could use their bodies to contribute to medicine and medical research. We used the stall in several different locations in Hereford, London and Manchester. We engaged with 500 people over 15 days. We then, again for each type of contribution, explored the effectiveness of five different incentives: a letter of thanks; a donation to charity; a small payment; a large payment; and a payment in kind. There was a grid for each donation type, mounted on a piece of large, brightly coloured foam board which was attached to an artist’s easel. How ethical the incentive was, from the point of view of society at large. For each incentive, people placed a sticky dot on the grid to show where they stood. For example, a dot in the top right-hand corner showed that they thought that that incentive would be both highly effective and highly ethical. Nearly three quarters of the people who took part were very comfortable with the idea of being on the organ donor register, yet fewer than half of respondents actually were. This suggested that policy should concentrate on getting more people onto the register, for instance by increasing the ways in which people can sign up. For all donation types, payments of any size were seen as unethical and ineffective by a significant majority of our respondents. Donation to charity was by far the most promising incentive to pursue, for all donation types. The results fed into a report by the Nuffield Council on Bioethics. We had one disappointment. Having three different ways for people to contribute, each with five incentives, gave those of us running the stall a lot of explaining to do. We had a lot of good discussion with individual participants, but we didn’t manage to create discussion between participants, as we had hoped. You can read more about this project here and a full write-up of the tools used.